Elaine McGillicuddy shares her love, life, and loss story that transformed her. Elaine G. McGillicuddy, a native Mainer, is a retired high school teacher of English composition. She lived in Missouri, New York, Massachusetts, and Waterville, Maine, during the 15½ years she was an Ursuline nun. In 1968, while still a nun and Campus Minister at Colby College during the heady anti-Vietnam war years – she met and later married Francis A. McGillicuddy, after he left the clerical priesthood. Elaine has a BA in English from the College of New Rochelle in New York, and an MA in religious studies from Providence College, Rhode Island. After a nine-week period of yoga study in India, Elaine, a certified Iyengar yoga teacher, cofounded with her husband, Francis, the Portland Yoga Studio which they directed for sixteen years. 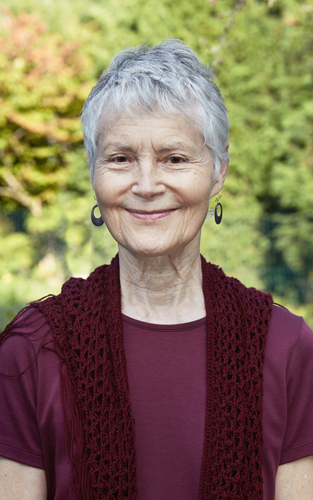 Certified as a leader of the Dances of Universal Peace, Elaine has been leading these participatory, meditative circle “Dances” or “body prayers,” once a month, since 1997. Engaged with writing (working on her next book whose title might be “A Widow Traces Life’s Arc of Love”) and maintaining the permaculture garden which she and Francis created on their 8,000 sq. ft. lot, beginning in 2006, Elaine lives a largely monastic life at home in Portland. Before her husband’s death in January 2010, Elaine occasionally wrote articles for CORPUS Reports, a national bimonthly journal. After the life-altering experience of the loss of a spouse, she knew her calling as a poet and writer had become an imperative. In 2016, Elaine published her fourth book, A Friend Who Knows the Tone. Mainly a book of poems (her third), its Preface includes an exposition of what a chih-yin is. All four of Elaine’s books are available at several southern Maine libraries and local bookstores, including Longfellow Books and Letterpress Books in Portland Maine. Orders can be placed through Longfellow Books from this website. Also, through Amazon.com. To arrange a book signing and reading of any or all of her four books, use “Contact,” to reach Elaine, or her facebook page.